Honors Program student Kylie Mims wants to earn a doctorate in adolescent delinquency prevention and intervention to help at-risk youth. She graduates in December with zero student loan debt. Full Name: Kylie Elana Mims. High School: "I graduated from Rutland High School, where I was the president of the Quiz Bowl Team, a Beta Club member, an Honor Graduate and an International Studies Program nominated traveler to the South Pacific." Current Employment: Student Coordinator for the Middle Georgia State Honors Program and Visitor Services Associate at the Museum of Arts and Sciences. Degree Objective: Bachelor of Science in Psychology, clinical track, and Associate of Science in Sociology. Activities: Honors Program member, Psychology/Sociology Club (soon to be Behavioral Sciences Club) and undergraduate teacher’s assistant for PSYC 1101 and Honors PSYC 1101 with Prof. Courtney Stavely. Career Goals: "The ultimate goal in most helping professions is to create a ripple effect that begins to counter the current of poverty, delinquency, mental illness and other struggles that limit opportunities for countless thousands of people. My ultimate goal is to be one of the rings of the ripple that reaches out to help those being pulled under by the tide, especially at-risk children and adolescents." She chose Middle Georgia State because … "It was affordable, and I could live at home while in school, which made it even more affordable. I will graduate in December with no student loans to repay!" The one thing that surprised her about Middle Georgia State was … "The professors’ credentials. Before starting school, I had been told that this was just a community college, that I was too smart to go here, I wouldn’t learn anything, people only went here because they couldn’t get into better schools - the whole range of stereotypical assumptions. But after starting classes, I quickly realized that those people had been completely wrong. Almost every professor I’ve had the privilege of learning under holds the highest degree in his or her field. Our professors have doctoral degrees from Cornell, LSU, FSU, UNC, UGA, Mercer, Clemson, Auburn, Notre Dame and others. There is no shortage of intelligence or credentials here. That plus the unending devotion to students’ wellbeing that each faculty member has demonstrated let me know that this was undoubtedly the right school for me." Her favorite professor is … "All of them. Seriously. One of the ones that I’ve spent the most time with is Courtney Stavely; I’ve had a class with her in some form — either as a student or as a teacher’s assistant — every semester for the past two and a half years. I love the way she encourages students to apply the material to themselves personally and to discuss how the material is relevant to their future careers. I am incredibly thankful to have had her as a mentor for the past couple years, both in my academic pursuits and as a professor-in-training. "I’ve also spent a lot of time with Dr. Clay Morton, both as an Honors Program member and as a student in his Perspectives on Neurodiversity and American Literature courses. I love the way he incorporates popular culture into his classes to make the material more relatable and comprehendible to students. Also, he invests so much time and energy in his Honors Program students, from impromptu advising when we’re panicking about class schedules, to finding conference opportunities for us, to helping us solve our existential crises when we realize that we’re about to graduate and have no clue what we’re doing with our lives. 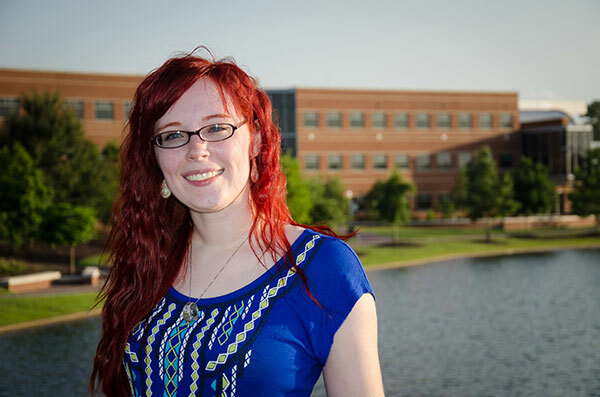 "I am immeasurably thankful to the entire Department of Psychology, Sociology and Criminal Justice for all the time and energy they have invested in me outside the classroom, from giving me graduate school advice to helping me formulate complicated research projects that encompass three classes’ worth of information. "And although she’s retired now, I have to thank Dr. Kathleen Grant for instilling in me a love of research through her Introduction to Sociology honors project, which I am now passing on to my own honors students." Her favorite place to study is … "I spend most of my time in the Honors Program study room, but when I really want to focus on reading or studying, I always curl up in my bed with music or a movie (mostly recently 'The Italian Job') playing for background noise." One thing people don’t know about her is … "I am a numismatist (currency collector); I inherited my great-grandmother’s foreign coin collection when I was eight, and I’ve loved examining currency ever since!" Her friends make fun of her because … "I often act like Rory Gilmore, from the mental cache of song lyrics at the ready to reference in any situation to the consumption of copious amounts of chocolate and ice cream without gaining weight." The one person she'd most like to meet is … "King Solomon. How incredible would it be to sit down and have coffee with the wisest man who ever lived? He would make a great therapist." Five years from now she sees herself … "Finishing up my doctoral dissertation on adolescent delinquency prevention and intervention, and working with social services agencies to implement programs and policies to help such at-risk youth. And hopefully by then I’ll have a hypoallergenic cat to greet me when I come home from work every day."